Robert Blazek is a highly respected marine artist whose paintings are found in collections and galleries throughout the world. His work is highly regarded for its luminosity, attention to detail and above all, its serenity. 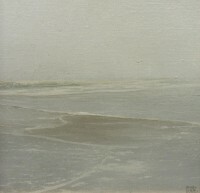 He focuses on the New England Coast, especially the rugged coast of Maine. His work is influenced by the Hudson River Artists, Frederic Church and John Kensett, and the writer Henry David Thoreau. 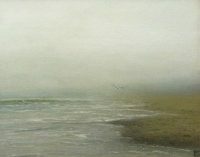 It displays such superb and subtle blending that critics say his technique is almost invisible, bathing everything in a soft, poetic light captured in one word: serenity. 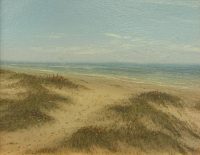 Robert is a Signature Member of the American Society of Marine Artists (ASMA), one of approximately one hundred distinguished artists in North America. He has a growing list of national and international awards and achievements. 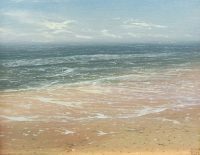 His work has received four Awards at the Maritime Gallery at Mystic Seaport; two Stobart Foundation Awards and two Awards of Excellence at their International Marine Art Exhibitions, the largest and most prestigious show held annually in the world. In 2006 his work was accepted into the American Art Library of the Smithsonian Institution, Washington, DC. Mr. Blazek’s work has been featured in many magazine articles and books including: Gallery of Marine Art by Jerry McClish, published by Rockport Publisher, 1998; the cover of the River Book, published by the State of Connecticut, 1998; Contemporary Marine Art published by the A.S.M.A, 2001; American Artist Magazine, August 2001; Palm Beach Illustrated Magazine (Nautical Treasures Presenting the World’s Finest Marine Artists); and most recently, Bound for Blue Water by J. Russell Jinishian, considered the definitive collection of the best American Marine Art of the 20th and into the 21st centuries. 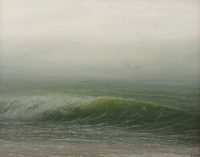 He is represented by the J. Russell Jinishian Gallery, Fairfield, CT and the Maritime Gallery at Mystic Seaport, Mystic, CT.